Postcards published by Mr A. Cook. c1930's/40's. Mr Cook, a Hullbridge resident was a prolific amateur photographer. He took a large number of pictures right from the 1920's into the 1940's, mostly with a glass plate camara. A good many he had published as postcards for sale to the visitors who flocked to the river in summer. 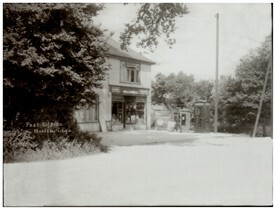 The first picture is of the Post Office/General Store on Ferry Road. 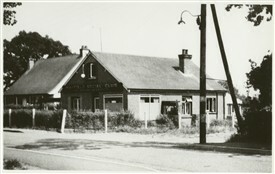 Hardly recognisable today this house is now the "One Stop" Tesco store and its still the village Post Office. The second picture was taken on Ferry Road. The side road on the right is Mayfield Avenue with the Mayfield Social Club on the corner, at that time just a single story building. This page was added by David Whiffin on 30/08/2013.